Detail the import methodology in Yemen. How to import to Yemen? What are the import procedures in Yemen to move goods? Explain about import registration process, cargo movement to Yemen from overseas countries, Import delivery process in Yemen etc. This post explains about step by step procedures that need to be finished with Yemen government authority for importation to Yemen. The Yemeni law requires that an importer who wishes to import goods for the purpose of trade must have a trade license and registered in the Register of Importers. According to products nature, certain goods for export may be subject to an authorization, license, rules of quality or packaging, standardization or special formalities. YCA Yemen Custom Authority under the ministry of Finance who is assigned with execution of all the decrees issued by the country’s ministries and governmental institutions which concerned, controls illegal trade and is facilitator of genuine trade. This post explains about different phases in import process that every importer needs to go through in Yemen. How to import to Aden? Import customs procedures required in Aden. Import Customs process in HODEIDAH. Process to import to MUKALLA. Requirements of customs to import to Aden. 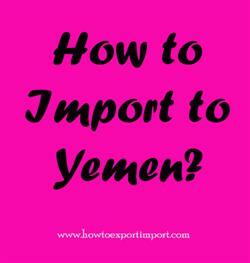 What are the documents required to import in Sana'a. What are the import document processes need to carried out with MUKALLA customs. Formalities for import to Sana'a. Procedures to import to HODEIDAH. Need to import to MUKALLA. Explain to import to Aden. Information to import to HODEIDAH. Step by step process to import to Sana'a. Methods to import to MUKALLA. Import Licence process in Aden. Process to import to HODEIDAH. Requirements of registration to import to MUKALLA. Registration requirements in Sana'ato import. Registration needed to import to Aden. How to import to India from Yemen?